Hey friends! The fact that my last post was in February is upsetting. 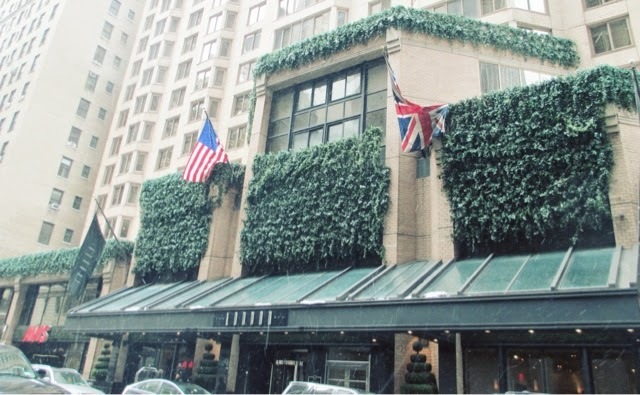 It's so easy to get caught up with life and fall behind on doing the things you loved - I definitely need to force myself to keep this updated and my first NYC post is a start! 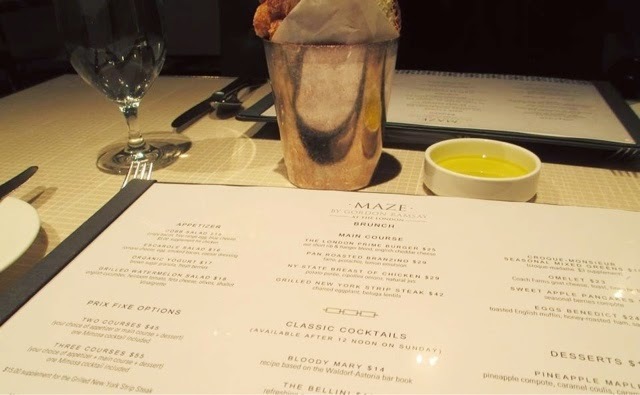 First post goes to MAZE by Gordon Ramsay at The London. 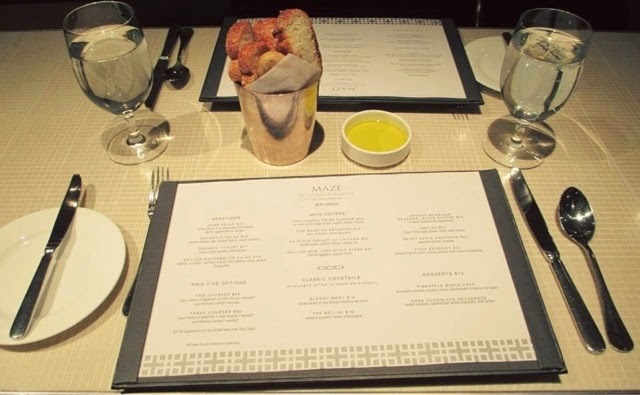 Located in the heart of the Theatre District, MAZE offers a French influenced menu in a modern and chic setting. 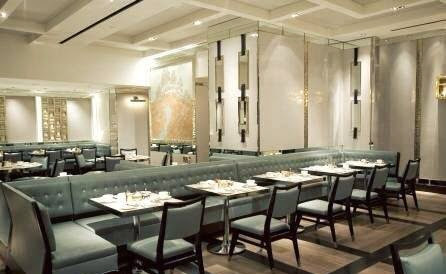 Tufted seating, structural ceiling designs and bright white walls, the interior was crisp, cool but still inviting. K and I were starving after a jammed packed morning, so to tie us over until the main course, we opted for an order of fries to snack on. With GR being such a Hollywood name, I guess we were expecting something life changing but we were pretty disappointed at how 'normal' these fries were. (Fine, this was partially our fault for setting these expectations...oops). 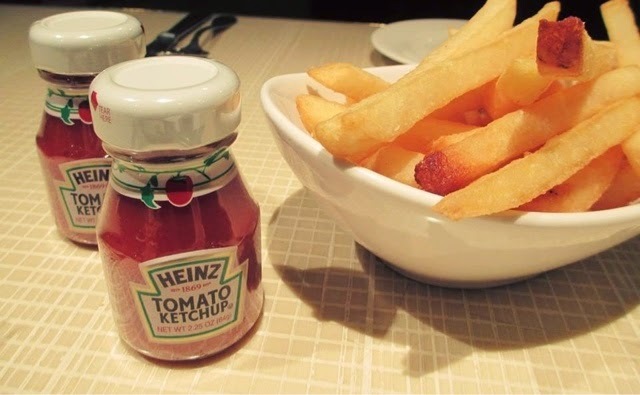 However, our disappointment was quickly mitigated by these darling mini-Heinz bottles. I literally wanted to take one home. 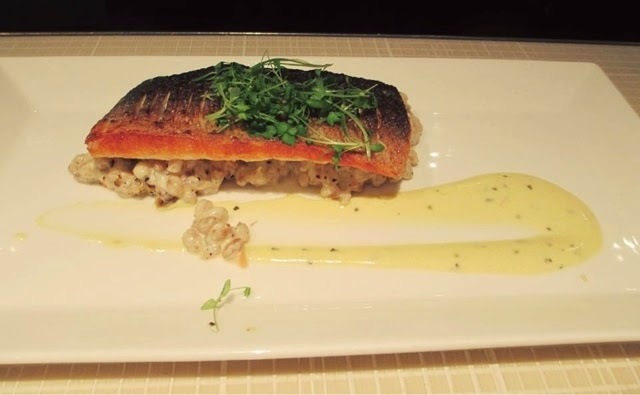 For my main, I ordered the pan roasted branzino (European seabass). The fish was cooked perfectly - nothing is worse than dry, overcooked fish. The only thing that I didn't like about it was there wasn't enough! 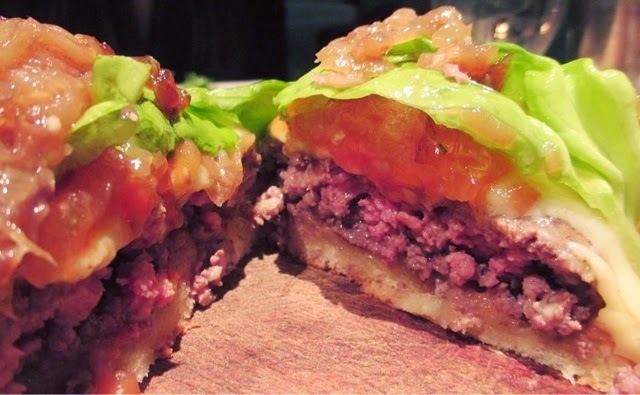 K ordered the London Prime Burger. The fact that you can't even see the meat in the picture below because it's lost under all the cheddar is a good thing. Similar to the fish, K agreed that the short rib was beautifully cooked - look at that gorgeous pink! All in all, I enjoyed the lunch! However, for what we got, it was definitely a bit on the pricier side. 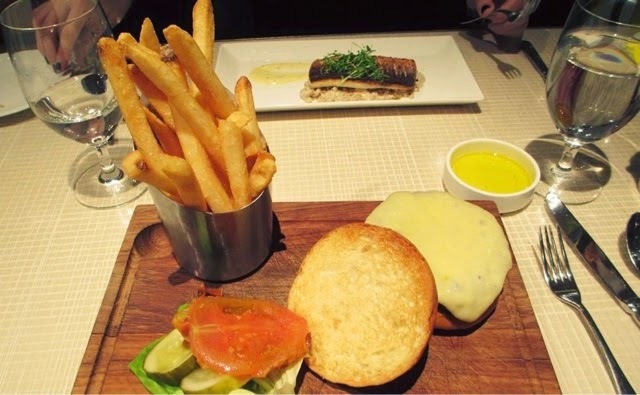 Was this one of my favourite lunch experiences? Not exactly, but I'm still glad we're able to check one GR restaurant off the list! More NYC posts to come! Until next time, love!